It can be caused by exposure due to a large eyelid opening or inability to fully close the eyelids, trauma to the eye, inadequate tear production, or irritation from eyelashes, eyelid hairs, eyelid tumors or a foreign body. Once the cornea is ulcerated, bacteria and/or fungal organisms can multiply in the wounded area and cause the ulcer to become much worse. If treated properly, minor ulcers often heal without complication. More serious ulcers may cause permanent scarring of the cornea or even progress until the eye ruptures. This is extremely painful and can require removal of the eye. 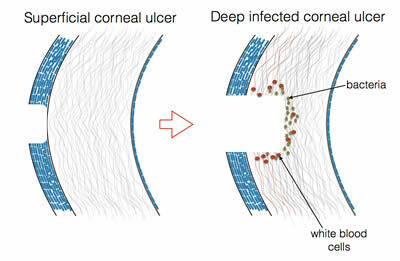 Some signs of a corneal ulcer include pain and squinting, redness, tearing, discharge, and an abnormal appearance such as a change in color (for example, red, blue-white, brown or yellow). Ulcers can worsen very quickly without prompt treatment and become much more serious, especially if infection is present. 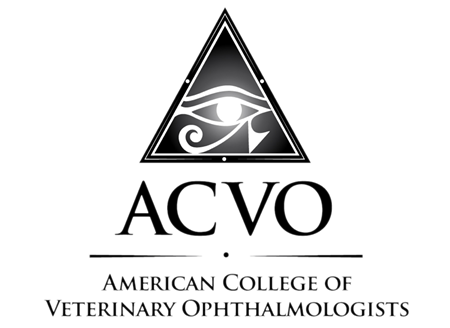 A careful examination of the eye is indicated to determine the underlying cause of the ulcer. Deep ulcers are generally treated surgically by placing a graft over the ulcer. The graft may be taken from the conjunctiva (pink tissue lining the whites of the eye) or adjacent cornea of the patient, obtained from a donor, or acellular collagen grafting material for support. 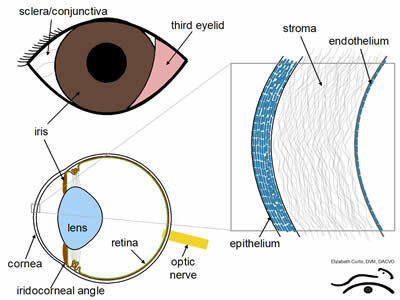 The advantages of conjunctiva from the patient’s own eye include providing a blood supply directly to the wound, tectonic support to the weakened cornea, and healing and growth factors provided by the graft. Disadvantages of surgery include scarring and potential graft failure. Graft failure is uncommon and the success rate of surgery is generally greater than 90-95% regardless of the type of graft used.